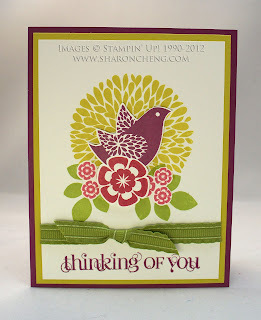 I cased this card which uses Betsy's Blossoms stamp set and Stampin' Up! 's new firm foam ink pads. Check out my special on the new ink pads at the end of this post. Many of us find it easier to get consistent results with the new firm foam ink pads. Stamps with a lot of smooth surface area like the images in Betsy's Blossoms stamp set can be more difficult to ink. My stamp club members noticed the difference when they made their cards using Betsy's Blossoms and the new ink pads. Here you can see the same image stamped using a freshly inked felt pad and then a firm foam ink pad. With the felt pads, I avoided images like this bird because it was difficult to get consistently good results. There are many tips posted on the internet about how to stamp bold images with a felt pad, but you'll probably find it quicker and easier to use Stampin' Up! 's firm foam ink pads. Initially, a skeptic about Stampin' Up! 's new firm foam stampin' pads, I've become a happy camper. Now I'm changing all of my ink pads to the new firm foam style. 1. Coordinating colors with Stampin' Up! 's card stock, designer series paper and embellishments is easy. 2. The new labels make it easy to color coordinate in English, Spanish, French or German. 3. You won't misplace the permanently attached flip and lock lid. 4. The ink pads are designed to store your inked pad upside down so your ink is right at the surface. 5. The firm foam makes it a breeze to ink your stamps, especially bold images. 7. The design of the ink pad make it easy to hold. 8. The firm foam stays flat and does not become wavy. 9. 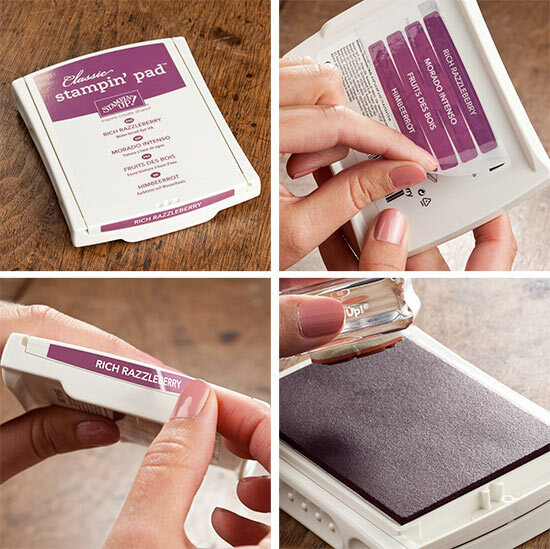 It's easier on your hands to ink up a stamp since it takes less pressure and less tapping. 10. The new labels are easier to read and have the name of the color on the front edge of the pad. *Stampin' Up! does not recommend that you use the old formula ink refills in Basic Black, Basic Gray, Marina Mist, Perfect Plum, and Tempting Turquoise with the new firm foam pads. Ink refills purchased after June 1, 2012 have the new formula ink. You can use the new ink refills in the old and new style ink pads. For the month of July, I'm offering a special to my newsletter subscribers on Stampin' Up! 's firm foam ink pads. Buy 5 of the ink pads, you'll get the sixth one free from me. Sign up for my newsletter now to take advantage of this special offer. You'll get a monthly newsletter with Stampin' Tips and more details about how to get your free firm foam ink pad. 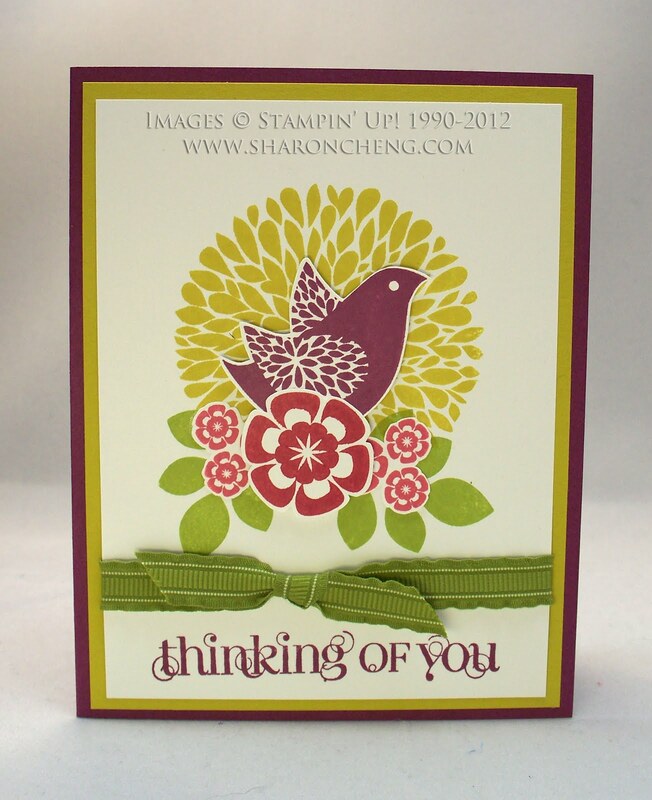 View Stampin' Up! 's video about the new ink pads on my Facebook Business Page. View the Stampin' Supplies for the Betsy's Blossoms card.